It is with great sadness that we report the unexpected passing of the father of Rutgers Chabad’s esteemed Executive Team Leader Josh Strimber – Avraham (Avi) Strimber, of blessed memory. Shiva is being observed at their home in Baltimore, MD, with family and friends, with many students from Rutgers attending both the funeral as well as paying shiva calls during this week, from Thursday, Feb. 24 through Wednesday morning, Feb. 29. Mr. Strimber was an adoring husband of his wife Mrs. Bracha (Backman) Strimber for 35 years, beloved father of daughter Shayna (Strimber) Cohn and son Josh Strimber, brother to Joseph Strimber, and grandfather to Tova, Rena, Uri and Eli. The Strimbers, who were pillars of their Jewish community in Philadelphia, operated a weekly radio show “Keep Your Eye on the Bagel” for 15 years, before their recent move to Baltimore, where they continued their wonderful efforts on behalf of the community. Mr. Strimber was exceptionally compassionate, an advocate for the homeless and shut-in elderly, who fed the poor and was the voice of truth on the radio. For students here at Rutgers, it was a big shock that Josh, Chabad’s Shul Student Director, Gabbai, Aleph Branch Staff Coordinator, and Torah Class Leader, had suddenly lost his beloved father. Scores of students, along with Chabad’s Rabbi Baruch Goodman, Rabbi Shaya Shagalow, and Hillel’s Rabbi Akiva Weiss, all drove to be together with Josh at the funeral service in Philadelphia. Close Rutgers student friends, including Noah Kinstlinger, Nate Sobel, Josh Herzfeld, Ross Leibowitz, David Gendelberg, Yael Novick, Shani Mendelsohn, Talia Friedman, Jeff Krieger, Dov Simen, Michael Schaier, Rachel Ullman, David Shenkler, Martelle Spiewak, Daniel Kohanim, Miri Tal Atlas, Yoni Polack, Scott Silver, Zev Deutsch, Leo and others, attended the funeral service and expressed their mutual feeling of shock, sadness and profound sympathies with the family. What was evident at the funeral is that the Jewish people lost a truly unique and special individual. The hundreds of people in attendance, the heartfelt speeches by rabbis, relatives and friends, all expressed the pain and sorrow of losing someone who gave so much to so many. 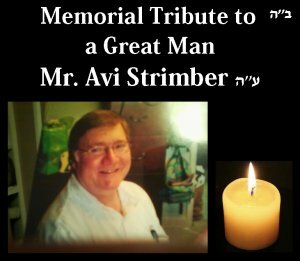 Although most of us from Rutgers had never met Mr. Strimber, from what we heard from the speeches, one needed just to know his son Josh to get a good feel for who Mr. Strimber was, a man filled with sincere joy, playfulness, humor, and with a great and insatiable enthusiasm for Jewish life, family and community. The rabbis and students at Rutgers all pray that G-d grant Josh and his whole family a full measure of nechama – comfort from On-High, and that they know only simchas – joyous occasion from now on. Click here and Scroll down to “The Avi and Bracha Strimber Show” for a special radio tribute. A Rutgers Jewish communal learning of Mishnayot is now being arranged by Chabad House and a fund drive is now underway as a tribute to the blessed memory of Mr. Strimber to purchase and dedicate new Siddurim and Chumashim on campus for student use. This project is being spearheaded by Josh’s friends Talia Friedman, Noah Kinstlinger, Josh Herzfeld, Rachel Ullman and Nate Sobel. Contributions may be made to: Chabad/Strimber Rutgers Tribute, c/o Chabad House, 170 College Ave., New Brunswick, NJ 08901.